2013 release at the Wurlitzer Organ in The Granada Cinema, Clapham Junction. Recorded in January 1978. ENCORE: The Wedding Dance / You Made Me Love You (Reprise). This is another in the series of budget price releases from the founder of the Audicord label (of which we now own the organ ‘arm’) and now owner of OK Rollem Productions, Ken Mellor. 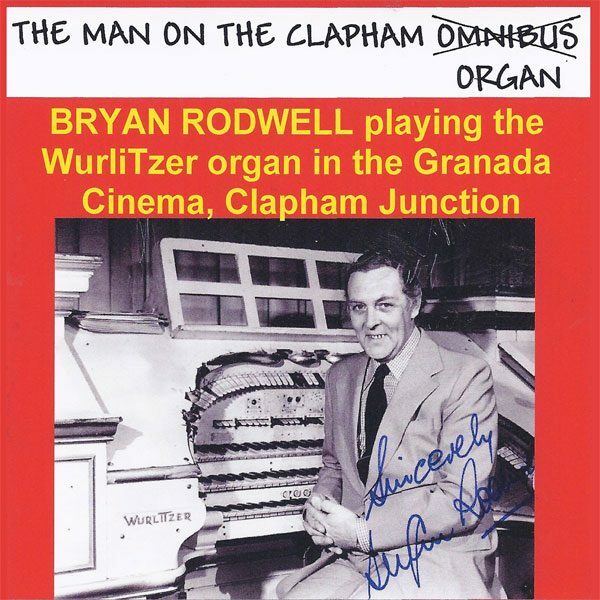 It’s the first of two new titles released on November 1st, this one being a Bryan Rodwell concert recorded in January 1978 on the Wurlitzer Organ in The Granada Cinema, Clapham Junction. The cinema opened in 1937 with its three-manual, eight-rank Wurlitzer (and grand piano). It was the third largest theatre in the Granada Cinema chain, but eventually closed in 1997. This concert was recorded by the late Alan Humby with cassettes of it (and various other concerts) being made available to members of The Bryan Rodwell Cavendish Club, which he ran during its brief life. Considering the concert was recorded over thirty-five years ago, the sound is pretty good too. The inlay (written by Alan Ashton who now owns the Humby masters) says it contains Bryan at his finest and I would not disagree. Although the CD is over an hour, it only contains five tracks with track four being an epic medley of sixteen tunes and just under thirty-two minutes, taking up over half the CD.